The size of each pillow refers to Insert size. 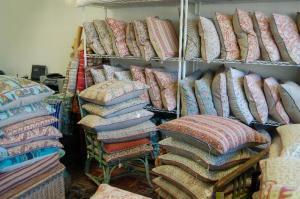 Pillow covers are made about 1" smaller to achieve the best fit and feel. 9.00% sales tax will be added to all shipments to a California address. UPS Ground is the preferred shipping method. Shipping charges (pillows) for UPS Ground are $10.00 per pillow for the first two, and $6.00 per pillow thereafter up to a maximum of five pillows. This includes insurance. Shipping charges for "And Etc" items are as stated. Other shipping options are FedEx Air, FedEx Ground and UPS Air. Charges for FedEx and UPS Air including insurance will be determined and e-mailed back to you for approval in order to charge on credit card. All requests for returns must be made by e-mail to C Geller within 24 hours of receipt of merchandise. A return number will be supplied and must appear on the outside of the box. Shipping is at buyers expense and must include insurance for the total amount being returned. Credit card will be credited after seller receives merchandise in good order. Merchandise must be shipped back to C Geller within 48 hours of receipt of return number. There are are no returns, exchanges, refunds or credits on sale items. All sale items are final.